Winter is a great time to hit the trail for more reason than one: not only are the crowds gone, but many parks show off their true beauty after a fresh snowfall. Zip up your jacket, grab the right snacks, and head to the nearest trailhead. But be wee prepared because, a combination of driving rain, high winds and temperatures just above freezing, represents some of the most challenging weather that a hiker can face. In these conditions hypothermia and frostbite (if the thermometer subsequently drops below 0°C / 32°F) are a very real possibility. 1. Dress in layers - Your base layer should be a wicking fabric that will pull your sweat away from the skin.Always remember to avoid cotton. Once wet, cotton no longer insulates you from the cold. Moreover, it wicks heat away from your body and puts you at risk for hypothermia. A fleece jacket is necessary for insulation and warmth and shell helps to keep you dry and stops the wind from penetrating your core. Always wear thick, winter-weight socks, since your toes are the first place you’ll feel cold. It’s also a good idea to have two layers of gloves or mittens, one for insulation and one for waterproofing. And don’t forget a hat that can cover your ears. A large percentage of body heat is expelled thru the head. 2. Keep your water bottle warm - If you're storing water bottles in your backpack during a very cold day, you may need to insulate them to prevent them from freezing. An old wool sock will work in this case. Turn the bottle upside down to prevent the water from freezing at the neck. This time of year, dehydration is especially dangerous because it can accelerate hypothermia and frostbite. 3. Sun protection - While this is most important if you are hiking in a snowy region, winter hikers often forget about the sun’s glare reflecting off of white snow. If you ski you may have a pair of ski goggles. 4. Consider the Terrain - In mid-winter, the snow may be too deep to hike high into the mountains. Hike at lower elevations, and wear snow shoes, to ensure safety on the trail. If you expect a lot of ice, especially in areas where there might be steep drop-offs, bring crampons specifically made for hiking. These are sometimes referred to as traction devices, or in-step crampons, which you can either strap-on or slide onto your boots.Bring hiking poles, as well. These help you maintain balance on sections of trail with slick ice and snow. 5. 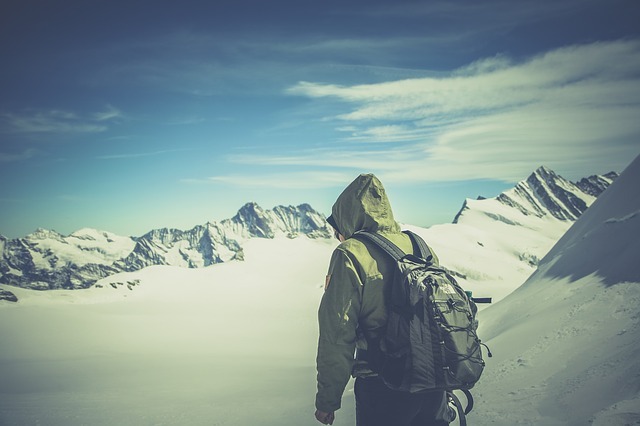 Stay Fueled - Hiking in the cold, especially in the snow, burns more calories. By some estimates, hikers can burn as much as 50 percent more calories when compared to similar distances and terrain in the summer. Avoid complications and bring plenty of high-energy snacks like mixed nuts together with dried fruit, power bars, hard boiled egg or a honeystick. Instead of storing food in your backpack, put small snacks inside your fleece jacket. A thermos of a hot beverage such as coffee, cocoa or soup is a genuine treat that you can carry in your backpack to enjoy during breaks. In addition to these tips and hints, remember to not forget these essentials at home, as well when hiking in the winter. Finally, let someone know where you're going, when you'll be back, and who to call if they don't hear back from you at a specified time.